My husband loves beer. He recently decided to start collecting beer growlers from small breweries. I do not like beer. Therefore, he ends up with a sizable amount of artisan beer that needs to be consumed in a short amount of time. “And this is a problem… how?” he asked. He gave me one of those patented husband looks that says you would suggest I use this precious elixir for bread. But that’s exactly what I’ve done twice now, and you know what? He thinks it’s a pretty awesome thing because he loves bread, too. 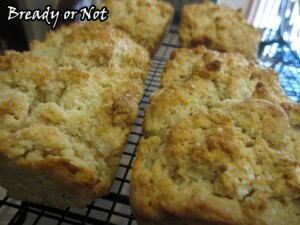 I have only made this using my Pampered Chef mini loaf pan. I love the size of those loaves! One is perfect for a meal or two, and they freeze fabulously. I just wrap them individually in plastic wrap, defrost in the breadbox, and then warm them with some butter. 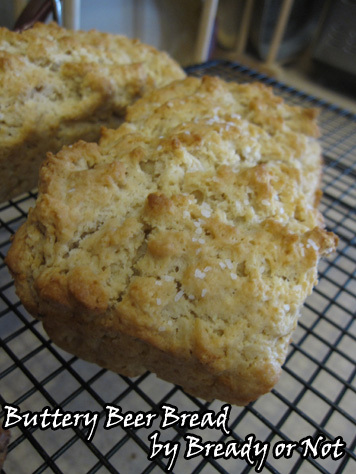 Recipe modified from Veronica’s Buttery Beer Bread at Jenna’s Everything Blog. Preheat the oven to 375-degrees. Prepare your big loaf pan or mini loaf pans by buttering lightly on the bottom (the sides will be well-buttered later on). Sift together flour, salt, baking powder, and sugar. Stir in the beer. It may be sticky and need to be incorporated by greased hands. Drop the dough into your pan(s) and even out the top as much as possible. Melt the stick of butter and pour it all over the dough. Using four mini loaf pans, it will bake for 30-35 minutes. The original recipe stated that a full-size bread pan needs to bake for an hour. Let it cool in the pan for about five minutes, and then because of all the butter, the bread should pop right out. Mmhmm. Well, I’m happy for you. There’s nothing better than a well-filled breadbox. This bread looks awesome, by the way. Possibly awesome enough to entice me to buy a beer to make it–neither Mike nor I drink the stuff, but we do love a good beer bread! When I used to buy boxed beer bread mixes, they always said that 12-ounce soft drinks could be substituted. I usually did Mountain Dew but used Pepsi a few times, too. I haven’t tried that with this specific recipe, but I imagine it would work, though maybe not with the diet versions. MMMMM. Can’t wait to try it! Beer growlers are 64-ounce containers for beer, most often in glass (actually, Arizona just made non-glass growler containers legal). It’s become a kind of artisan/hipster thing for restaurants to be brew pubs where you can then buy your favorite beer to bring home. You purchase the beer and container, and then you can make a return trip later and just fill it with beer for a cheaper price. It’s fresh, unlike the grocery store stuff. Some more info on growlers. Congratulations on your 4 star review from RT Magazine, and what a wonderful article–which led me here. I’m an author too, and love to bake. The beer bread looks fantastic. Before I became a vegetatian, I made beer roast. What a meal the two of them would have made! Thank you so much, Gini! I do beer roasts on occasion, too. 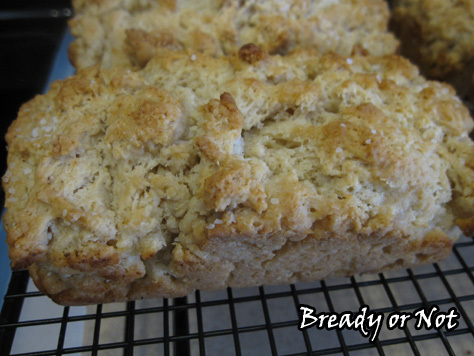 I hope you enjoy the beer bread recipe–it’s become a regular in my household.